How does the red wall appeal to you? Color can do loads to give a first impression but not that you have to paint your wall RED, but you get the attention! Come on ….! We just bought the most expensive item in our lives so far! How are we supposed to be left with any money to spare, we don’t. But we do aspire that when we move into our new home we would like to have beautifully painted walls. Lighter earthy shades do push the walls out and create the illusion of a larger space and hence making your living room look bigger! We would like some new furniture or refurbish our old ones with some nice fabrics, accent pillows, may be a new rug, put in some DIY elbow grease and make it look like a magazine cover page home, may be even hire a designer! This Mantle Makeover with paint - Courtesy Lowes, makes a statement no doubt and that has been achieved simply by paint and some imagination! The stark reality however hits us and we realize soon that hiring a designer on a larger scale is expensive and out of reach. But with some smart choices and options that does not have to be unaffordable at all you can opt in for a Designer Consult on hourly service or choose a Design Package . We all want to stretch our dollar and get the Designer touch without the Designer price! This White Color Palette can easily be created in a condo scenario. IKEA style scandinavian furniture can easily keep the cost low and some bright color pops is all that is needed to tell your story. How can you hire Design Help? Seasonal Leaf Designs’ Color Palette Consultation does just that. It can be the perfect solution for your smart dollars and give you the insight about what to do with your home to make it look good without committing a whole lot. A 2 hour solid consult can give you all the guidelines and resources that you need to put your best foot forward to bring that Color Pallette into your home that speaks just of you. How much do you spend on a Consult? On a smaller budget you can get some direction as to what paint color to choose, what color goes with what? May be the look of the Fireplace mantle can be updated to make it exciting! Doing something on a smaller budget not only saves money but gives us a sense of accomplishment that we finally have the complete picture and it did not cost that much either! A Design Consult on Color can also be beneficial to your pocket. Most Designer’s have an account with their local area paint store as they send all their clients and hence with that association comes designer discount of anywhere between 5-10%. Most often Designer’s pass that discount to their clients and you as the homeowners can save quite a bit of money on paint colors. Testing paint colors with your designer! 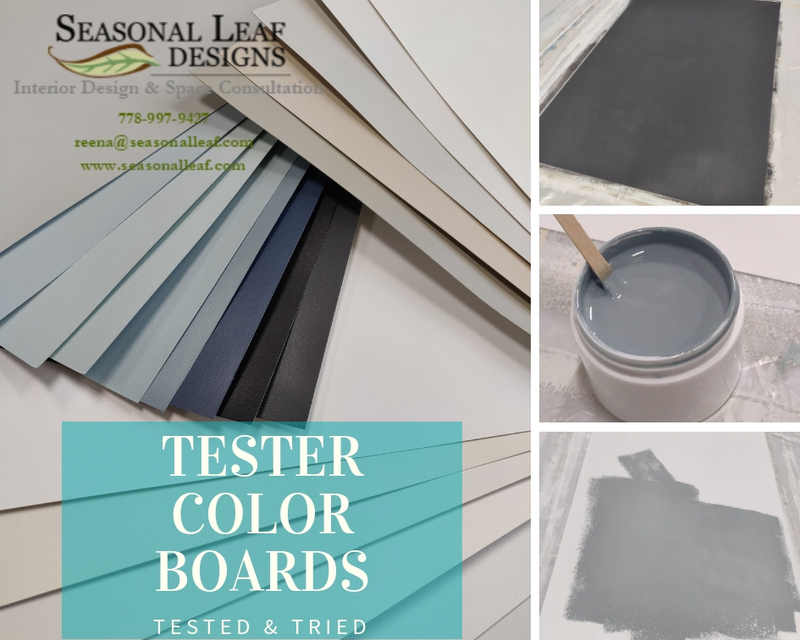 Many or most times getting color suggestions from your designer results in doing tester boards where your Designer collaborates with you to paint white cardboards with real samples of paint and roll on with mini rollers or brush. They have the technique to finish off the boards as if they were your walls in the exact same way your walls were to be painted. Instead of dabbing the paint on - which most people do if they are trying on their own - Your designer takes care to do a good finish on the tester samples. At that point your are able to see first hand what that finish or color would look like and having an actual painted big size board allows you to see for yourself in real life what your walls would really look like. Improve Your chances to apply the Correct Paint Color for your walls - Examples of Seasonal Leaf Designs’ Color Tester Boards that we use for our consultations and we carry these to our Client’s Space to show. These are made from real paint which we personally paint. Yes you could paint patches on your walls directly …. But remember that your existing walls may not give you the white canvas that is usually required to get the true color of the paint. Doing patchwork paint on your existing walls which incidentally may be painted yellow years ago, will result in a total mishap of lost identity for your chosen color. And prepping the walls with a base coat gets expensive for just experiments. So to get true and tested color suggestions hiring the Designer, who works for you and is on your side with your best interests in mind is a game that is won before your started playing. Most often your Designer is also equipped with certain other finishes such as tiles, counter stone, hearthstones, fireplace wall stone, wallpaper, upholstery fabric and more. And if asked they would add some benefits for you at the consultation for an additional charge that would certainly be more helpful for you than break your bank. They have samples that they can bring with them if required and if decided from before. They can provide you with a Consult package pricing that becomes quite reasonable if compared to the costly mistakes made after your purchase the stone or the tile at your local Home hardware store. At such a consult your Designer will provide your with an array of choices that will be co-ordinated in color & texture with the rest of the room or space and after the consult you can take those suggestions and pictures to shop for the item at your local Home Store. Again most often the Designer will know a supplier that will provide you with beautiful one of a kind product but at a good price on the Designer’s account instead if you were to shop on your own at a retail price point. Seasonal Leaf Designs’ Mood Board showing a collection of colors and finishes for various surfaces which would be beneficial to you as a First Time Home Buyer to have. Getting a Consult Package can come with a collection all kinds of co-ordinated material finish suggestions which can then become your shopping list and you can use a resource that has already been figured out for you.